Fort Fido Dog Daycare & Boarding News Blog: Two new dogs! Yesterday we met with the happy and energy-filled Daisey. 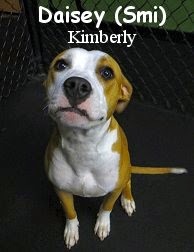 She is a nine month old, forty-eight pound, Tan and White Colored Pitbull Terrier. Daisey was all "wiggles and wags" as she entered into The Fort's Big Roll. She is a very athletic canine, that is here to socialize and burn off some excess energy... And that's exactly what she did! Daisey was quick to befriend the other dogs, she made playmates effortlessly. Daisey should prove to be a wonderful addition to our Big Roll Pack. She did an outstanding job and we plan to see her more! In the clips that follow, you can spot Daisey having an awesome time with Doug and Tucker. This morning, we were up bright and early to Assess Maxx. 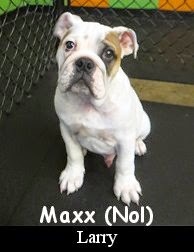 He is an irresistibly-cute, three month old, twenty-one pound, English Bulldog. This little fella is going to grow up to be one big and strong canine, but for now, he's just a small pup. Maxx is here to hone his canine-communication skills and have a good time exercising. To ease him into the joint, we had Maxx start out in our Medium Roll Play Area. Once inside, he explored eagerly, knowing he'd be meeting with some other canines soon. After letting him get his bearings, we had Maxx meet up with pack members Stella and Max (Mue). That combination of dogs proved to be just perfect for Maxx. They began to wrestle play within minutes of meeting one another. Given strong leadership, time, and consistency, Maxx should grow up to be quite a calm and balanced adult dog. He has a great temperament, and is the perfect age to get into Dog Daycare. He'll get a lot out of socializing at Fort Fido. Welcome Maxx, swell job today pal! Here's Maxx jamming with Stella and Max (Mue).